February 22nd marks the 1st anniversary of my blog (AKA blog-iversary)! Let’s jump right into the celebration and mark this awesome occasion with, what else, cookies! I created these cookie bars a couple of months ago, but they are the best recipe I’ve invented so far and I wanted to save them especially for today. 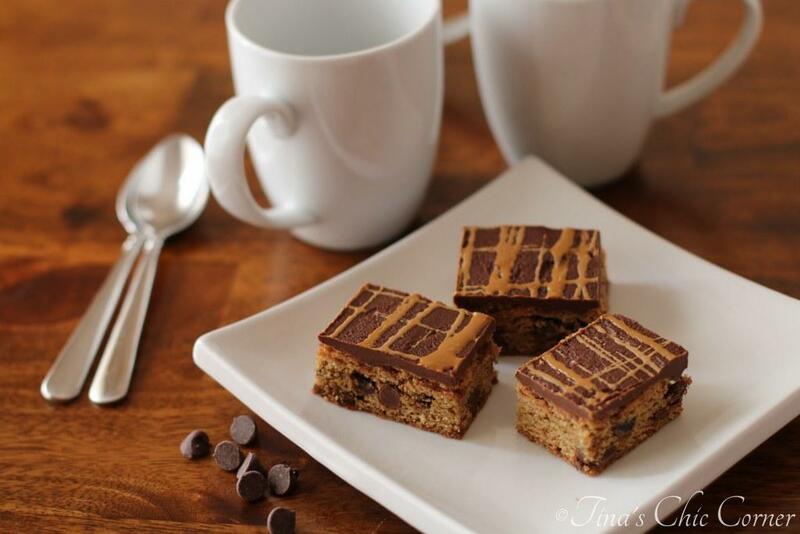 These chocolate chip cookie bars are infused with lovely coffee flavors, coated with a sweet chocolate frosting, and drizzled with a coffee flavored icing on top. Line a 9 x 13 baking pan with tin foil, grease it, and set it aside. 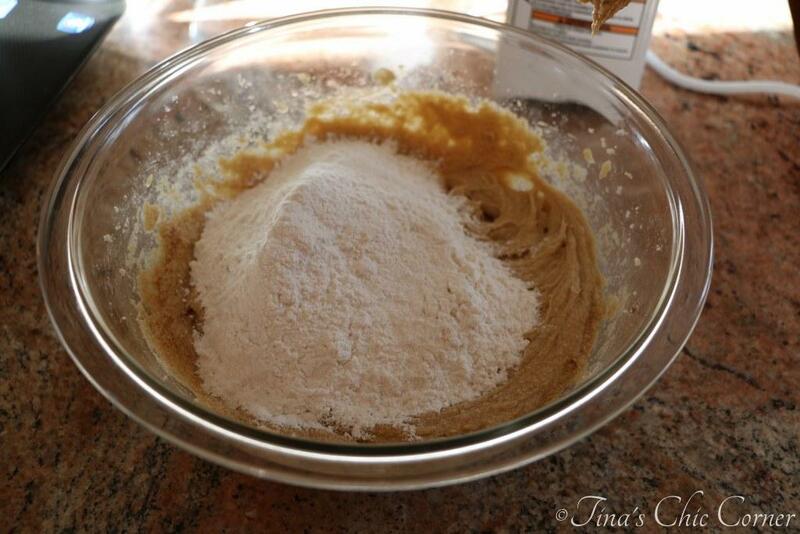 Whisk together the flour, baking soda, and salt. 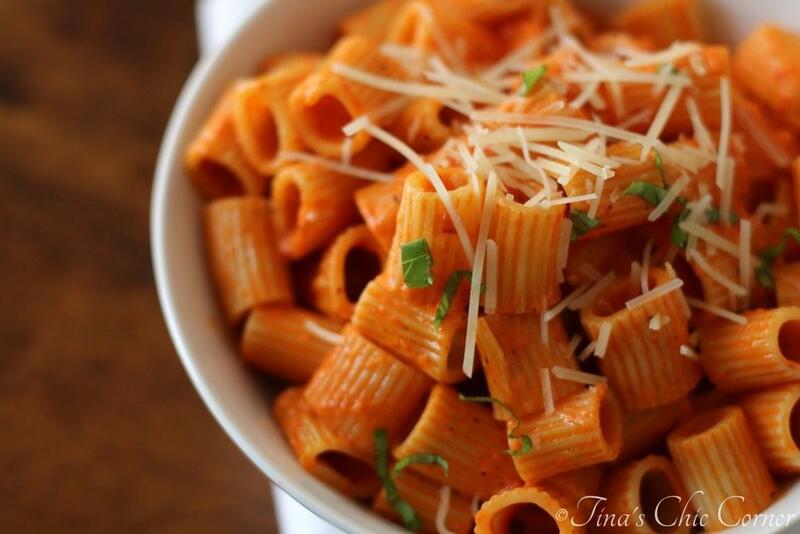 Set aside the dry ingredients. Mix the instant coffee and hot water together and set it aside. Cream the butter, white sugar, and light brown sugar. Mix in the vanilla extract, eggs, and coffee mixture. Pour the batter into the prepared pan and bake it in the preheated oven for about 25 minutes or until a tester inserted comes out clean. Let the cookie bar rest in the pan until completely cooled. Spread the chocolate frosting on top. Drizzle the coffee icing on top. Melt the chocolate chips and butter until the mixture is smooth. Stir in the vanilla extract, salt, milk, and powdered sugar until it’s the texture of frosting. Note that the frosting will be warm at this point and it will set over time. It’s easiest to spread the frosting onto the bars when it’s warm or room temperature. Mix the instant coffee and hot water together. Let it sit for a few minutes until the coffee grounds have dissolved. Let’s start this party with the cookie bar. It’s just like making chocolate chip cookies (with a touch of mocha) but better because it’s faster. You’re basically making one giant cookie. Oh yeah! 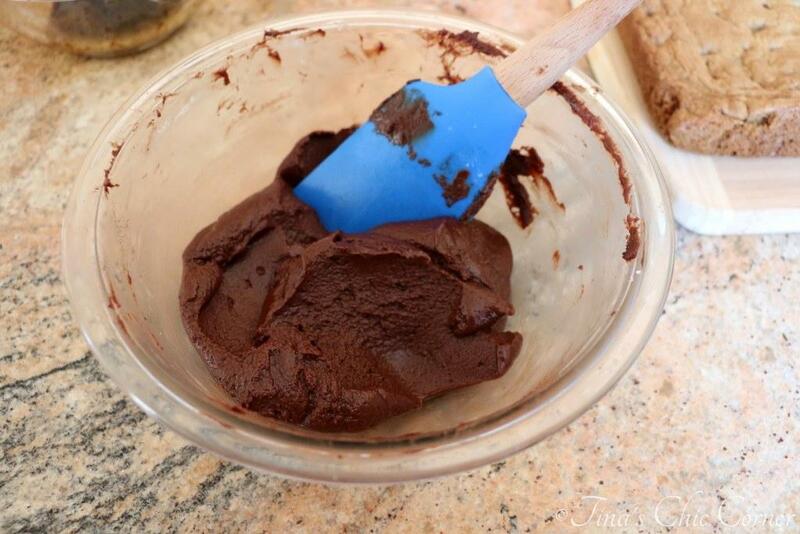 The chocolate frosting is so simple to whip up. Can you see the chocolate chip cookie bar in the background anxiously waiting to be covered with some sweet decadent chocolate? Make sure the cookie bar has completely cooled before you add the frosting otherwise the frosting will just run away from the cookie and that’s no fun. I could drink this coffee icing straight up like a martini. 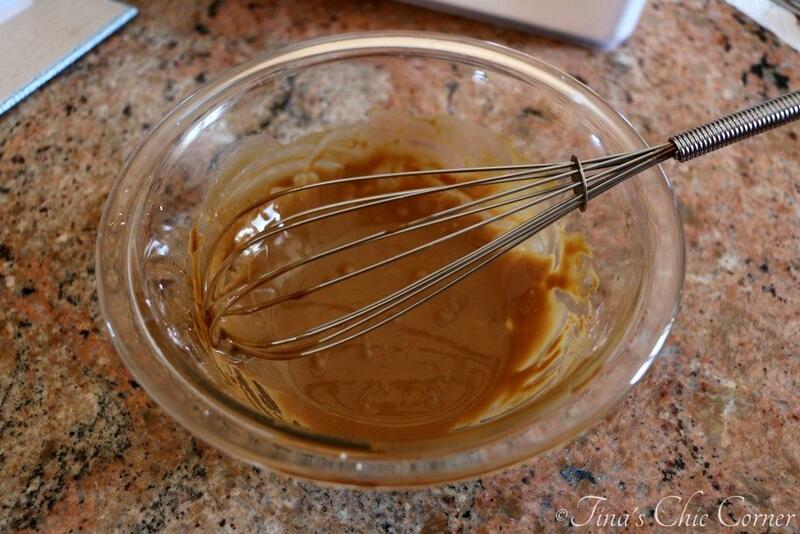 The consistency should be thinner than the chocolate frosting in order to drizzle it on top of the chocolate frosting. Pow! 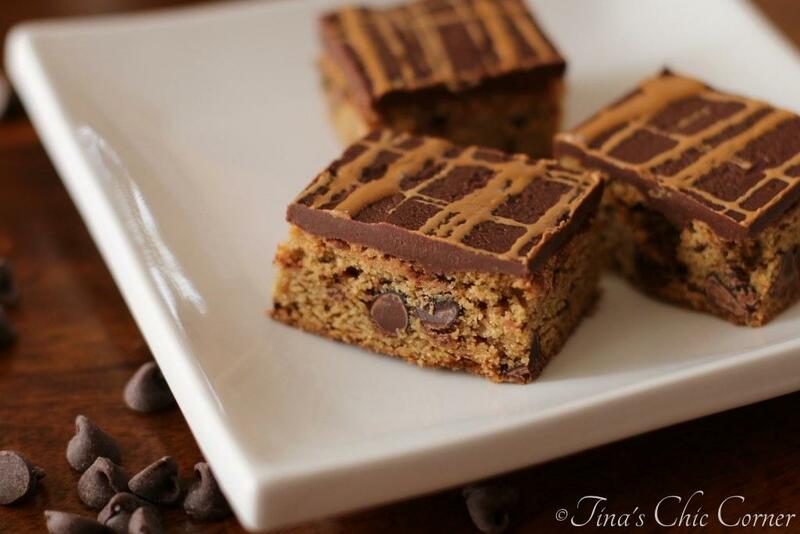 Coffee chocolate chip cookie bars! 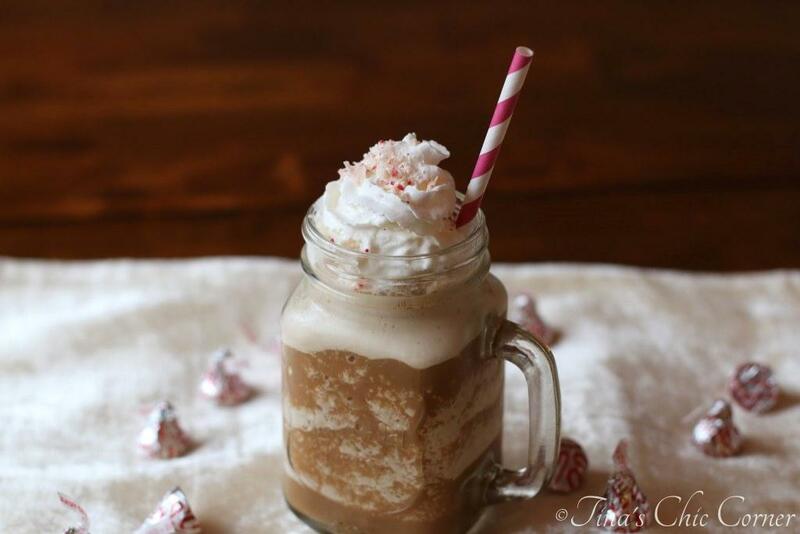 If you love coffee and chocolate then you are totally set with this gorgeous creation. You can definitely taste the coffee in the bars. You know how some recipes claim that the coffee ingredient is merely an essence and you can’t taste it? That’s NOT the case here. Chocolate. Check. Coffee. Check. In fact, my husband is super sensitive to caffeine and wouldn’t even try them because he knew how much coffee went into them. Next time I make them I’ll use decaf instant coffee so he can enjoy them too. 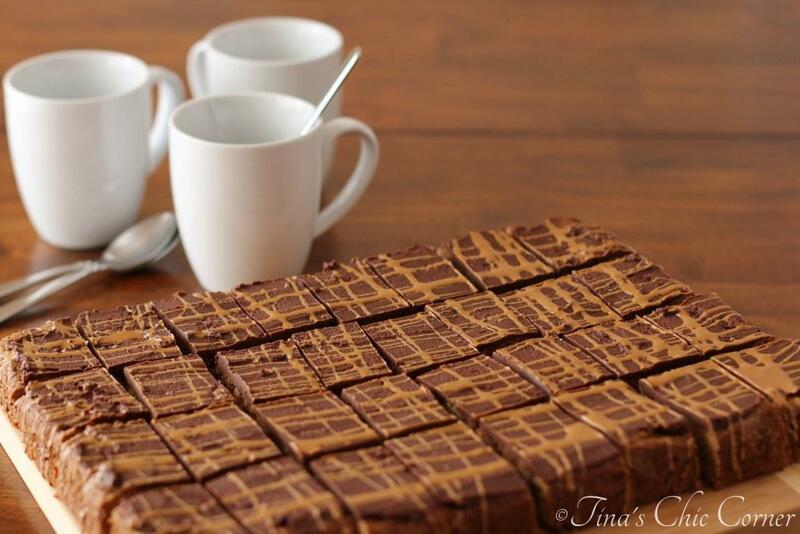 Chocolate and coffee are two of my favorite things so combining them makes a perfect way to celebrate one year of Tina’s Chic Corner. The coffee icing is crazy amazing. It just adds more wonderful coffee flavor to every bit. Not to mention the fact that the drizzle makes them look so pretty. I sure do love things that are both delicious and earn me style points! Here are some of my favorite recipes over the past year. Congrats on one year!! Can’t think of a better celebration dessert!! These look delicious! 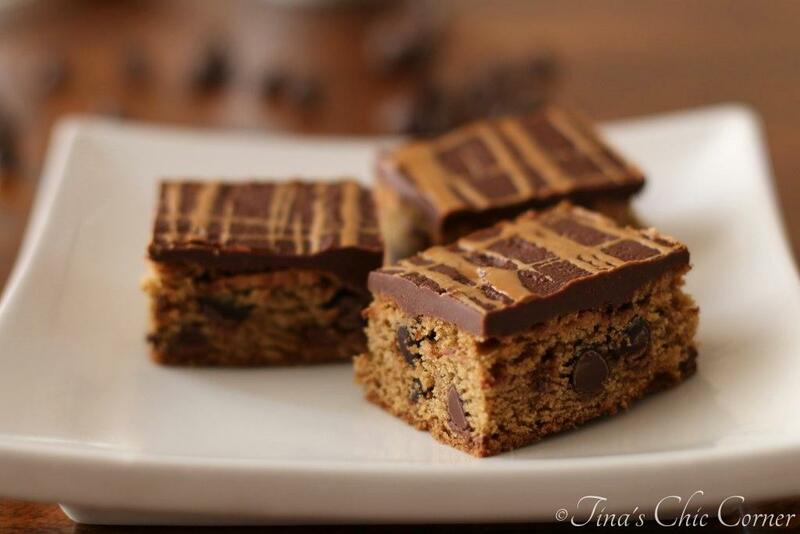 Cookie Bars are one of my favorite desserts and I love this version. So exciting that your blog is about to have it’s first birthday – how awesome is that? Happy Blogoversary!! Happy 1 year blogiversary! What a great opportunity and boy does time fly! 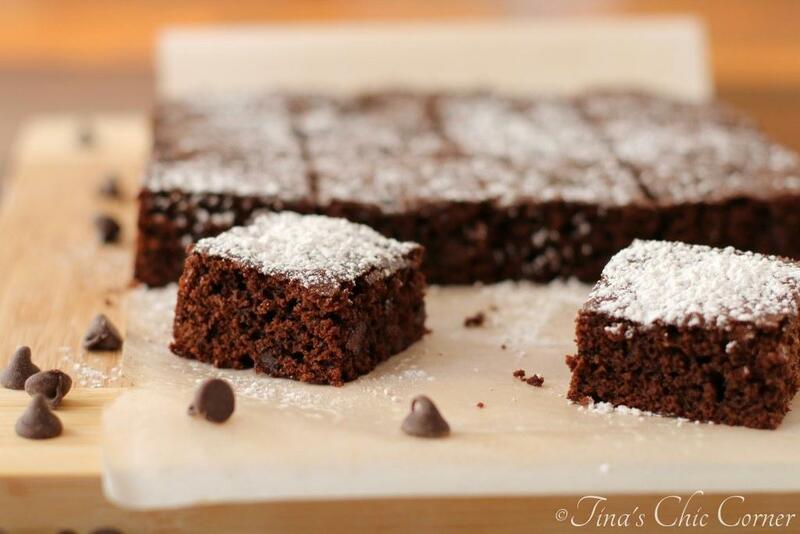 Looking forward to reading many more years of delicious recipes such as this coffee chocolate chip brownie. That would go perfectly with my cup of tea. Happy Birthday to Tina’s Chic Corner! Congrats Tina! So happy to be along with you on your blogging journey! 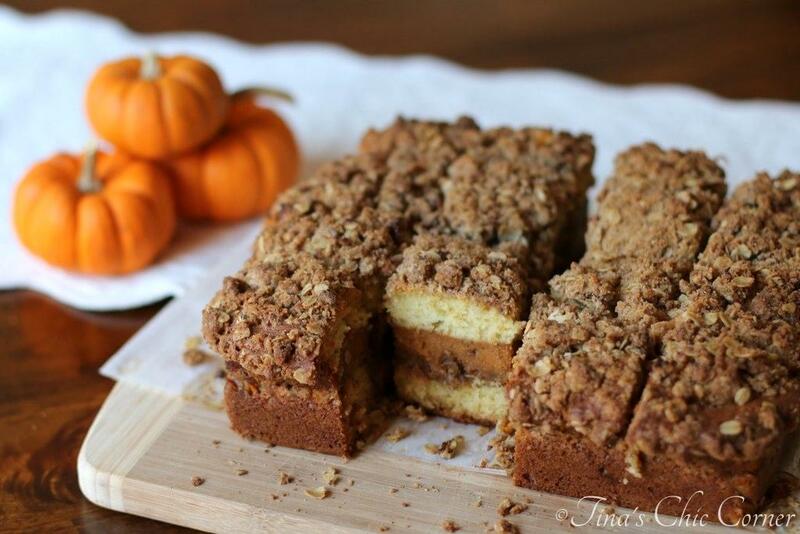 And, you can never go wrong with celebrating with cookie bars! I’m so excited for you, Tina!! I’m right behind you, girlfriend! (Mine’s next week …on my 40th bday!) I’m loving these fun bars… so pretty, too! Coffee AND chocolate chip cookies? It’s all of my favorite things! Happy 1 year T!!!! You’re like my blogs cool older sister (albeit by 2 days ;))! And what a way to celebrate. Looking forward to hearing we you have in store later this week! Statistics say that 9 out of 10 bloggers quit in a year, so getting through the first 365 days really is the toughest part! Congrats girl! I’m so happy you started your blog and kept at it, otherwise I wouldn’t have ever seen many of these tasty treats! Oh man these bars. I want. All. Congrats on the anniversary dear!!! Happy belated blogiversary!! 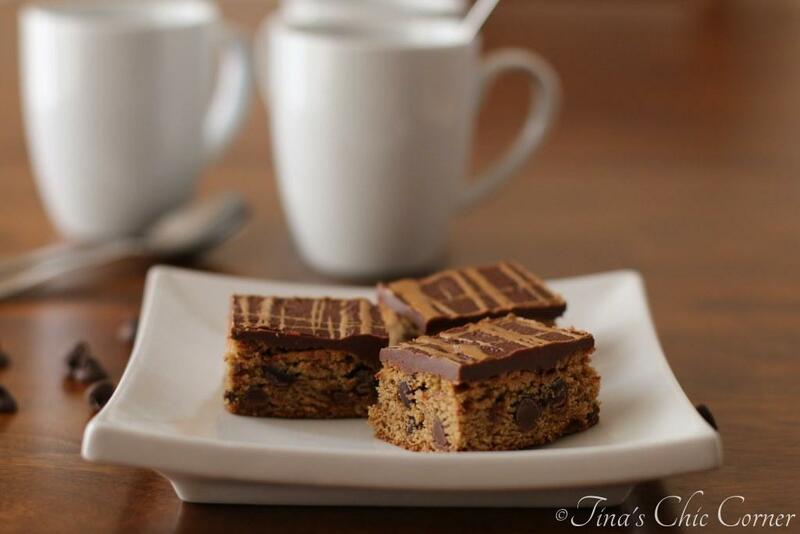 These bars are perfect for the celebration 🙂 Nothing beats chocolate and coffee!! Ahh! You had me at coffee! These bars looks so delicious, and I’m pretty sure I could finish off the whole tray all on my own. Pinned!